PlayFusion and Games Workshop have forged an alliance to bring trading card game, Warhamer Age of Sigmar: Champions, to both Nintendo Switch and Steam. With the rampant success of the physical and digital game, with 20,000,000 physical cards sold and over 1,000,000 digital matches played, the Mortal Realms are teeming with Champions to challenge. 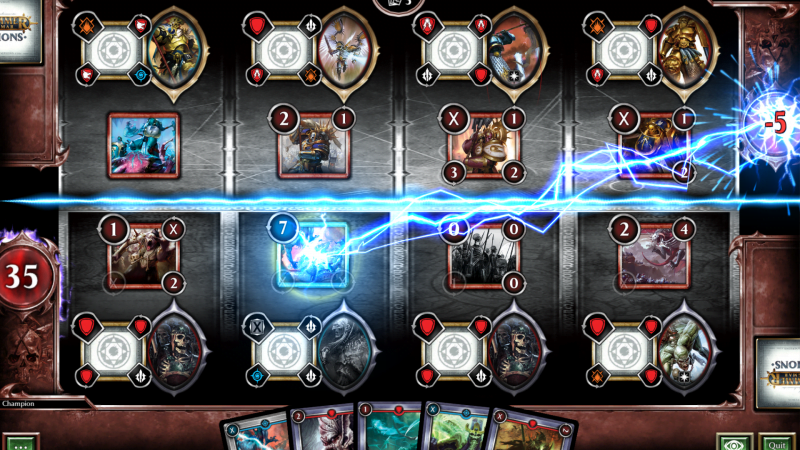 Warhammer Age of Sigmar: Champions is a modern collectible card game that presents a connect play experience; by blending physical and digital card collections, players can scan physical cards into your collection to claim them and take them to conquer the battlefield. Take the custom crafted decks from one of the four Grand Alliances and challenge friend or foe across the world, and across platforms! Pick up a Nintendo Switch, grab a mouse and take battle-ready decks and battle opponents on all playable devices. New owners will be able to temper their skills in the fires of war immediately, and with new content and cards being added regular, the time to enter the crucible of Warhammer Champions is now. Learn the crafts of war in the robust tutorial, then be ready to test skills against AI or other players in Casual mode, AI challenges, and full narrative campaigns. For the truest test, take on the challenge of Ranked matches for huge rewards and to reach the highest rank possible each season! The banners of war will be raised when Warhammer Age of Sigmar: Champions comes to Steam in February and Nintendo Switch later in Q1.